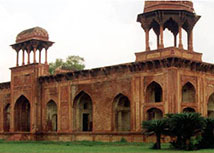 This tomb is located 13 km from Agra on the left side of Agra-Mathura road to the west of Akbar’s tomb. It is the tomb of Mariam Zamani, a Rajput Princess of Amber (Jaipur) who was the wife of Emperor Akbar and the mother of Jahangir (Salim). The tomb is the real specimen of Mughal style of architecture renowned for its beauty of white marble construction and embedded design. The tomb looks alike from front or back which is a special feature of this tomb. This beautiful piece of Mughal structure was originally a pleasure pavilion which was built under Sikander Lodi in 1495 AD. Later in 1623 AD it was converted into a tomb. 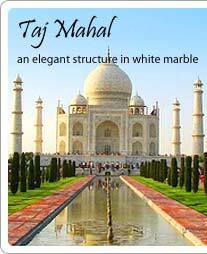 This tomb is a weighty sandstone structure with fine carvings on most of its exterior walls. The ground floor houses the cenotaph of Mariam. The large chattris placed at each corner and the four rectangular kiosks surmounting the center of each façade. The red sandstone façade is divided into numerous panels and adorned with several geometric pattern structures. The tower is capped by a pavilion supported by slender pillars. The upper story contains the marble cenotaph which is open to sky.